New York: Duffield & Co., 1910. First Thus . Hardcover. Very Good. Parrish, Maxfield. Very Good condition, a very nice copy, tight and square. Some surface wear to the pastedown illustration on the cover, but the gilt itself is bright and complete. Gilt on the spine less so but still very nice. Top and bottom of book cloth on spine tender but not broken. Corners bumped but intact. All plates present and guarded by tissue. New York: Duffield and Company Blue cloth-bound boards, titled in gilt at the spine. Full color illustrated paste on at the front, by artist Maxfield Parrish. 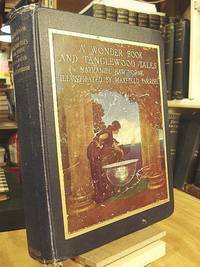 Contains color illustrated frontispiece and 9 other full page color plates by Maxfield Parrish, all tissue guarded. The boards are moderately worn, lightly rubbed and stained at the extremities, the cloth at the corners are slightly frayed, and there is a water stain at the bottom left corner of the back board. The sides of the text block are darkened, the pages are slightly toned, and the endpapers are lightly speckled with foxing at the edges. Otherwise the illustrated paste on at the front is clean and complete, the illustrated plates inside are bright and clean, the onion skin tissue guards are all intact, the pages are clean and without tears, the text is unmarked, and the book is tightly bound and in very good condition. (VG/No Jacket.) 358pp.. Hard Cover. Very Good. New York: Duffield & Company, 1914. 358 pp. Original blue cloth covers w/ title in gilt and pictorial paste-down on front cover. Binding lightly soiled and rubbed. Corners of front cover a bit bumped. Light scattered foxing. Previous owner's name in pencil on front blank endpaper. Approx. 1" tear at top margin of half-title page for "A Wonder Book." Illust. w/ 10 color plates. . Hard Cover. Very Good-/No Dust Jacket. Illus. by Maxfield Parrish. 8vo - over 7¾" - 9¾" tall. New York: Duffield & Company, 1919. Original blue cloth with color plate on front cover. Quarter-inch area of front cover rubbed off; bookplate; notation on frontfly.. Very Good. Illus. by Maxwell Parrish. 2015-07-22. New. Ships with Tracking Number! INTERNATIONAL WORLDWIDE Shipping available. Buy with confidence, excellent customer service! New York: Duffield & Company. Nearly fine copy in chipped dust jacket. 1922. Later prt.. hardcover. Tall 8vo, 358 pp., The jacket is missing a large piece at the top of the spine which contained most of the lettering; a little smudging on the fore-edge, else a nice, tight copy . New York: Duffield, 1910. hardcover. very good(-). Maxfield Parrish. Illustrated by Maxfield Parrish with 10 full-page color plates with lettered tissue guards; pale blue pictorial endpapers. 358 pages. Large 8vo, navy blue cloth with inlaid pictorial label, lettered in gilt (slightly edgeworn and with several stains on rear cover; label a bit scuffed); uncut edges. New York: Duffield & Company, 1910. A first edition with the Parrish plates. A very good(-) copy, clean and solid. New York: Duffield, 1910. hardcover. very good. Maxfield Parrish. Illustrated by Maxfield Parrish with 10 full-page color plates with lettered tissue guards; pale blue pictorial endpapers. 358 pages. Large bvo, navy blue cloth with inlaid pictorial label (some scratch marks), lettered in gilt (cloth slightly edgeworn), uncut edges. New York: Duffield & Company, 1910. A first edition with the Parrish plates. A very good copy, clean and solid. 2015-07-22. Good. Ships with Tracking Number! INTERNATIONAL WORLDWIDE Shipping available. May not contain Access Codes or Supplements. May be ex-library. Shipping & Handling by region. Buy with confidence, excellent customer service! 2014-07-20. Good. Ships with Tracking Number! INTERNATIONAL WORLDWIDE Shipping available. May not contain Access Codes or Supplements. May be ex-library. Shipping & Handling by region. Buy with confidence, excellent customer service! 2014-07-20. New. Ships with Tracking Number! INTERNATIONAL WORLDWIDE Shipping available. Buy with confidence, excellent customer service! 2017-10-06. Good. Ships with Tracking Number! INTERNATIONAL WORLDWIDE Shipping available. May not contain Access Codes or Supplements. May be ex-library. Shipping & Handling by region. Buy with confidence, excellent customer service! New York: Duffield, 1922. Hardcover. Very Good/No Jacket. Cloth with color illustration pasted down on front cover, 25 cm., 358 pp., with 10 color plates. Very good copy. Pencil inscription on front blank. Pages 164-165 with adhesive from sticker of a rose in middle of page (text of p. 164 only is affected.) Edges and corners of covers slightly worn. Cover illustration with some minor stray scratch marks. New York: Duffield & Co. Hardcover. Prior owner details to FEP. Spine recently re-laid. . Very Good. 1928. 12th Edition. New York: Duffield & Company, 1922. Hardcover. Maxfield Parrish. 358pp. Quarto [24 cm] Dark blue cloth covered boards with gilt stamped titles and an illustrated paper label mounted to the front cover. Good only. The extremities are gently bumped and rubbed, and the boards are barely perceptibly concave. The edges of the text block are very slightly darkened and soiled. The endsheets are split along the hinges. There is a contemporary gift inscription on the front free endsheet. The text block is cracked at p. 5. Dark patches on pp. 35 and 35. Parrish began as an illustrator for children's books and developed into a muralist and leading illustrator. He produced art for 33 publishers including Harper's Bazaar and Life. New York:: Duffield,, 1917.. Later Printing of this Edition. Hardcover. Octavo, about 9.5 inches ((24.5 cm) in blue cloth with pastedown on cover stamped in gilt. . 358 pages illustrated by ten color plates. Parrish's romantic pictures complement these stories very nicely. The book is clean and soundly bound with minimal even toning to the text. The covers have light extremity wear, and the cover pastedown has a couple of tiny abrasions at the bottom causing minor but obvious loss of surface color. Iyer Press. PAPERBACK. 1443757977 Special order direct from the distributor . New. Foster Press. PAPERBACK. 1443705640 Special order direct from the distributor . New. CreateSpace Independent Publishing Platform, 2017. Paperback. Very Good. Disclaimer:A copy that has been read, but remains in excellent condition. Pages are intact and are not marred by notes or highlighting, but may contain a neat previous owner name. The spine remains undamaged. At ThriftBooks, our motto is: Read More, Spend Less.Dust jacket quality is not guaranteed. CreateSpace Independent Publishing Platform. Paperback. 1977993001 . Fair. 2017-10-06.